Nuremberg late 18 th century? Purflings in ribs are usually seen at the corners, or in the center of the bottom rib. I would think they always indicate a glue joint or splice in the ribs at their location. Possibly not a one piece bottom rib- aren't those purflings on each side of the button, that may also continue up to the top, hidden by the tailpiece gut? Could be a 3-piece bottom rib. I sent a message to Jens Stenz in Denmark- he researches Danish makers, and is quite knowledgeable in that area. Perhaps he will take a look and post his thoughts. FWIW- When I had my first eye 'done', there was a noticeable difference in color for me- mostly in the reds; the "new" eye perceived a more magenta or blue-red than the other eye. Nice Italian Racing Red cars had a distinct wine hue to them that was quite displeasing. I could cover one eye, then the other to compare. But then when I had the other eye done, a short time later, I lost the ability to compare, and the problem I perceived, went away. The Dr. claimed my 'old' vision was deteriorated, and the 'new eyes' were giving me the correct colors. I still don't believe that. I also noticed, for some time after the surgery, I didn't see level areas as being level- they had a quite noticeable slant. But all-in-all, it is nothing short of miraculous. Generally, the consensus seems to be that copying is not good; not creative, etc. So why, then, do so many makers seek to replicate patterns of the 'ancients' to the nth degree? It seems contradictory. The workmanship can be extraordinary, but the creativeness, signature, or hand of the maker is lost, or at least diluted. I can understand using established and accepted patterns in a general way, but making the ff's exactly the same; corners exactly the same; the edge-work.. At least the ancients can be told apart..
Delabo- I think Mr. Merkel was referring to the age of his knee, rather than his computer. I believe I have the distinction of being the first to "out" Craig regarding his multiple posts. I can only participate with thoughts/suggestions- No one has yet mentioned a label for the instrument, but I think considerable thought should go into it. It would be nice if one of Craigs' labels could be used, possibly along with a second, explanitory label or inscription. 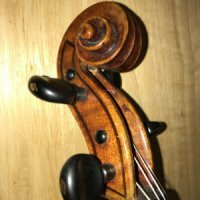 I've posted this before, but here are some cello f-holes with extensive "fixes". Can be seen at this angle/lighting, but otherwise quite unoticeable.